Free Rice scheme made conditional to MLAs and officers cleaning up their villages. I am very anguished at the slow pace of rural sanitation. Last two years I have not seen local representatives and concerned public officials determined to make rural Puducherry clean within a time frame. This was the 155 Morning Weekend Round Of Team RajNivas spanning over the last two years. Yet we have not transformed in proportion to the effort and energy that has gone into. In all our rural visits we have seen community leaders putting forth various demands on behalf of the people, but I have never seen any of them impatient at cleaning up the village in their constituency. Which is the cause of several diseases also in the village through contamination of water. In view of this attitude I hereby direct that distribution of free rice to the villagers shall be conditional to the certification of the village being open defecation free and free of strewn garbage and plastics by submitting a joint certificate given by the MLA and the Commune Commisioner to the Civil Supplies Commisioner. Till then the free rice supplies will be kept on hold and in safe storage. It shall be distributed to the beneficiaries on the village being certified clean. The certification shall also be cross checked to ensure its veracity. All constituencies are given four weeks notice to clean up their respective areas to be entitled for the free rice. The notice period ends on May 31st. I am sure the community leaders including concerned public servants will take the lead in this transformation. I also urge the NABARD to support only NGO who has inbuilt waste managment as integral part of its training programs. 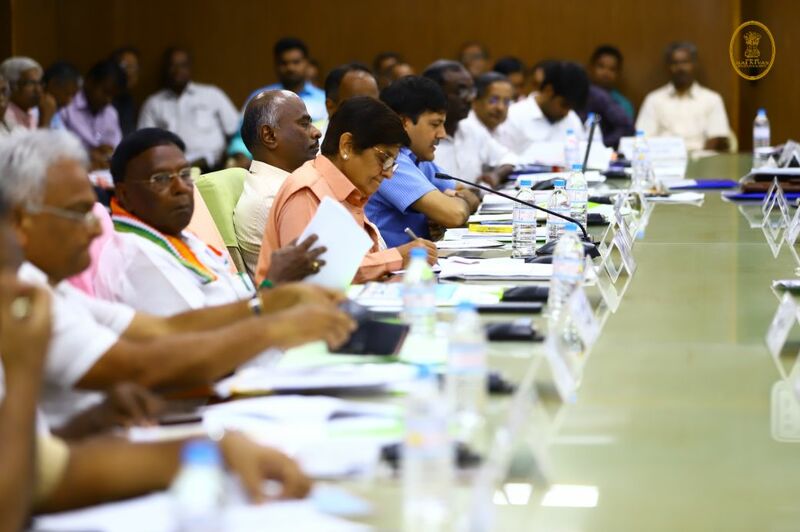 Giving Puducherry a ten year vision plan. Here are my opening remarks today at the Meeting of the State Planning Board on Annual Budget 2018-19. - We have financially scrapped through last year and could pay our committed bills till the end of last financial year. - However at the cost of certain essential areas like Civic amenities and rural care. - We have areas of revenue generation where we could have generated additional resources. Hence we need to correct that this year. - After presentation of the annual plan by the Secretary Planning and detailed deliberations by the Board and the Cabinet the budget cap of Rupees 7530 Crores was approved. - In my concluding remarks I asked officers to flag policy and financial issues and place matters before the cabinet for timely resolutions. - There are three key players to improve matters further. - First the role of administration leadership. - They must attend and build from what they have. And address internal managment issues like training, capacity building, rationalisation of work force, redressal of public grievance and field delivery. - For the cabinet I said. They must meet more often and take calibrated risks to address policy and financial issues. - They need to inform and communicate their respective constituencies of the role people can play in sanitation, safety, skill learning, sustainable agriculture and public health. This will save resources and enable more quality service to the people. - I requested our two members of the Parliament to engage with Central Ministries in addressing UT issues which will reduce time pressure on Secretaries for frequent travels to Delhi. Thereby being away from Puducherry. - C) 100 % Central finding of Centrally Sponsored Scheme as is the case with other UTs. - E) waiver of legacy loan of Rupees 7000 Crores by central government. - F) Setting up of Family and CBI Court. 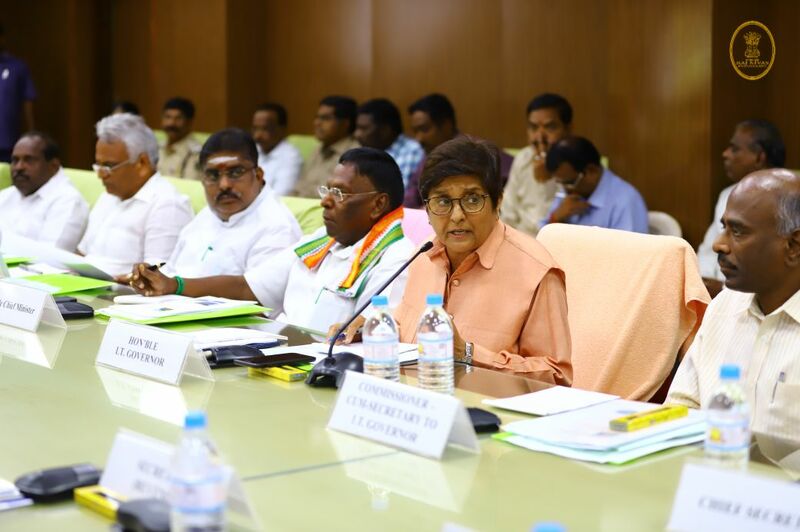 In the end I requested the CM and tasked the CS to bring out a vision document for Puducherry and Karaikal for next ten years which specifies meeting of annual targets in areas of water, sanitation, public Health, skill development, agriculture, Tourism, renewable power, education, rita Development and all other priority sectors. With a road map for finances. - By this the the Board passed the budget projection of 7530 Crores for the current financial year. When I called on PM. And PM Instructed all concerned to fully support. We thank our PM.. The RajNivas Secretariat intervened last year when no one in our political and departmental administration in Puducherry was willing to protect the interest of hapless but aspirational students. It’s a time in history of the UT when RajNivas had to stand by itself. Needy Students and their parents were seen running from pillar to post. The Open House at RajNivas brought forth the evidence of apathy. This is when Team RajNivas stepped in and take the bulls by the horns. The RajNivas Secretariat brought in GOI in the accountability right Upto the PMO. We wrote and went personally and explained the need for intervention to crush the prevailing mafia once and for all times. The MCI too realised it had to step in and supported us. They exposed the lies which were being told. ( evidence exists of this too). Meanwhile these efforts led to stepping in of a missionary and well placed lawyer in Chennai, Mr VBR Menon who took up the cause probono. All this was closely observed by the Chief Bench of the Madras High Court and commented. An interim judicial order led to capping of the fees to be charged by Deemed Medical Universities and need for a committee to fix their fees. We were defended by our ASGs at minimum cost. While the Medical mafia was by a battery of expensive lawyers. This powerful lobby took the matter to SC for a stay against the order of the HC, using its money and muscle clout. They have failed. Justice has won. This order is a final nail in the coffin of historical exploitation of a nexus which existed in exploiting the meritorious poor for decades not only in Puducherry but around the country. Not to forget CBI cases are still pending which also got registered on the complaints of the hapless parents associations. This order is a culmination of determined fight against inherited injustice and prevailing mafia then. The SC order not only does justice to Puducherry but to all other States if they choose to apply. The current changes in officialdom in Chief and Medical secretariat supported the break from the past in SC finally. And is changing more with change of officers. Play your roles to the fullest. Clean up the systems. Remember every obstacle is an opportunity. Trophies are not won by spectators. But what must go away and addressed is the causative-criminal behaviour of these potential criminals/and brutes who are overpowered by their lust..
We have to get to the root and branch. The root and branches are their homes.Their own Parents, family, communities and their teachers. The root and branch is also the politico-criminal justice system visibly led by police and political reps at those vulnerable places. They are the real preventers and detectors. The real failure is here. Every home, family, school, educational institute, community leader, law enforcer has to repeatedly assert the message that women are for equal respect and not assault. We have to recreate, create and renew this assertion perhaps for long time still to cleanse the past and the present till the mind sets change. Media too must also show responsible restraint from using the medium as a repeated biology class. It be best left to teachers to rationally explain in a science class room..